Black and white bathrooms have been popular since the advent of indoor plumbing. The dramatic contrast between the two extremes is a departure point for almost any decor style. Create an old-world look, evoke the early 1900s, or design a truly modern bathroom using black and white. You just might be amazed by all the options you have working with these two basic colors. Tile is used in some way in almost every bathroom. 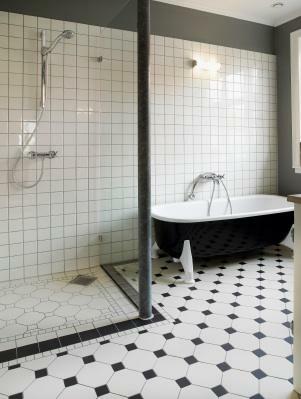 Black and white tiles make a strong statement and are available in many patterns and materials. Floor: If you are inspired by historical styles, consider installing small square or hexagonal floor tiles in contrasting black and white. For a more modern and luxurious look, install black marble or granite floor slabs. if you are on a budget, look into sheet vinyl flooring. There are many designs available that mimic stone or real tile. Wall and Backsplash: Ceramic or porcelain subway tiles are a popular choice, as well as the standard square format. These shapes work with almost any bathroom decor style. Consider using black or white mosaic tiles as a backsplash or to accent one wall, such as in the shower. Bath fixtures, including the sink, toilet and bathtub, are traditionally white. Some manufacturers make black versions, but unless you are choosing an ultra-modern, sleek fixture, you run the risk of looking dated: black fixtures were popular in the 1980s. Try a white pedestal sink or a vessel sink mounted on a floating, black-lacquered vanity. Freestanding tubs such as claw-foot tubs or a more modern, sculptural interpretation look right at home in this dramatic decorating scheme. Most bathrooms are tiled about four feet off the floor, and then the remainder of the wall is painted drywall. If you chose a bold black and white floor pattern, opt for simple white tiled walls with black trim and paint the rest of the wall white. If you are using stone slabs, you might, for example, run white marble slabs all the way to the ceiling to contrast with a black floor. A way to add some interest to a black and white bath, especially a powder room, is to install wallpaper with a bold pattern. Keep the rest of your design clean and simple, and choose a pattern that is floral, geometric, or traditional damask. Choose an elaborate mirror that looks like a piece of art, such as one with an antique silver frame, a black lacquered frame, or etched glass details. Opt for stainless steel accessories such as soap dishes or dispensers, towel holders and faucets for a modern look, or black wrought iron or brass for traditional decor. For storage, look for for shelving units made of these same metals, black-lacquered wood, or whitewashed wood. Fluffy white towels are a classic choice, but you could layer black towels as an accent. The shower curtain provides an opportunity to bring pattern into the decor. Consider some of the same patterns as discussed for wall coverings, just don't use both at the same time. Just add a little color. Black and white is a bold combination, so don't take away from the overall effect. Consider clean, bold colors such as lime green, red or powder blue. Add color by hanging a painting on the wall, setting out decorative soaps or soap holders, or a installing a sculptural vessel sink. Black and white bathrooms are timeless, elegant, and adaptable to any style. If you're considering updating your bathroom prior to selling your home, this color scheme is a great choice.